 Peaceful Hours: Believe it or not, this is not the one I actually used a seam ripper on. Looking at the photo I see a few places where I probably should have (what happened to the gray point above her head?)! Made with Heather Ross Far, Far Away Volume I, Gray Leaves from Little Apples, and Fuschia Beads. Peace and Plenty: this was actually not as bad as it seemed for 32 little triangles. I paid no attention to fabric direction and sewed all 16 sets together by chain piecing. In Tufted Tweets and something aqua from Sherbet Pips, I think? Northern Lights: In prints from Heather Bailey. This one is pretty boring. But, on the plus side, everything lined up nicely without a seam ripper! Ozark Mape Leaf: in Paris Apartment green stripe and Venice in aqua. This would be the block keeping my seam ripper busy. Why? Who knows. Seemed straight forward enough, but on these little blocks a small error in cutting or a bit of stretch in those pieces sewn on the bias can be a disaster. It does not quite make a square. And I was really digging this block. Darn. "Huh? I'm not even on your project, Mom!" Not all blocks are measuring 6.5". Not all blocks are flat. Some blocks are downright ugly. Not so sure I like sampler quilts. These blocks would make some very cool little projects without much extra effort. In the photo, they actually look better together than I feared. 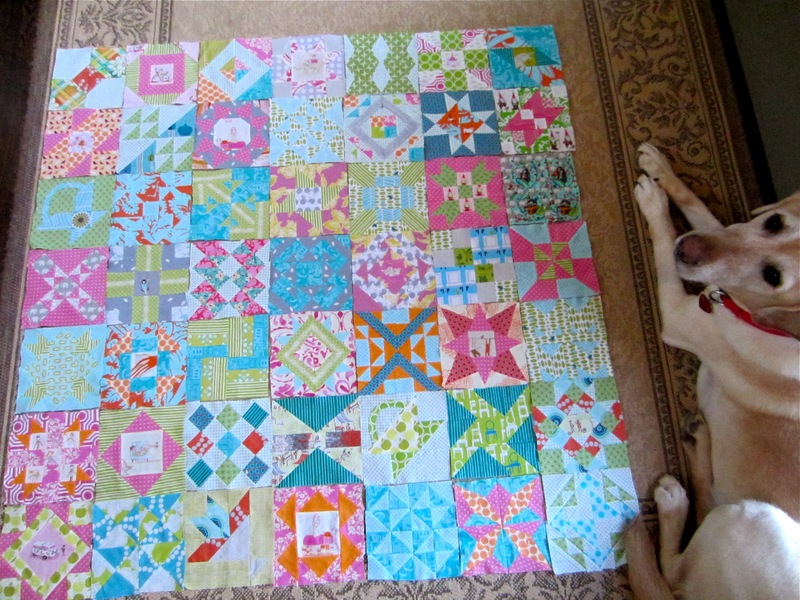 It would be a really interesting quilt to snuggle under and really look at all the blocks. What the heck else am I going to do with these blocks. I really want to continue making more. I definitely have learned a lot in this process. For now I am just going to keep plugging along with it. After seeing this picture I am thinking of making a small throw with some sashing - using the blocks that end up being the correct size & shape! hehe... i think they're looking great. and this reminds me that the biggest thing i've learned from quilting is how to let go (at least a little) of this whole perfection thing. i avoided quilting for so long b/c i thought for sure my corners wouldn't line up and it would drive me mad, but i started finding that those little "imperfections" are just the trademark of something made by hand and that there is beauty in that as well. I think they look great all together. I would just go ahead and smack those babies into a quilt. You have official inspired me. I have been wanting to try hand peicing for a while and I think I may order this book and get started on a Farmer's Wife for my brother-in-law's wedding gift!